We are not passive in this process - change takes work. But the power for change comes from God and that gives us hope. Secular psychology and Biblical discipleship approach change differently. When someone is struggling with an area of dysfunctional behavior, both will consider whether there could be a physical cause that is triggering the dysfunction. Illness, both physical and mental, can lead to behavioral issues. Substance abuse can also trigger behavioral and emotional problems. These issues are best addressed under the care of a medical physician. When dysfunctional behavior cannot be directly linked to a physical cause, the process for treating the problem becomes more subjective. Quite often, the behavior will be studied and analyzed, and then it will be categorized so that it can be effectively treated. You cannot treat a problem that has not been properly diagnosed. The byproduct of this diagnosis is a name, or label, that identifies the dysfunction. One concern is that while the intent of this process is to help identify and then deal with the dysfunctional behavior, that label itself creates an additional hurdle and possible entrapment. For example, take a person who has been diagnosed with bipolar disorder. Bipolar disorder has no cure. People who are diagnosed bipolar can learn to cope with their condition and can take medication to help them manage symptoms. Yet they are faced with the fact that at best they will be able to manage their condition. They are never cured, or "set free". A Biblical approach takes into consideration a spiritual cause to the behavioral dysfunction that secular psychology does not consider. That spiritual cause is sin. An improper view of God, a faulty view of ourselves, a duplicitous lifestyle, and bitterness are all factors that can produce the same emotional and behavioral struggles that are often labeled as a disorder. The role of active discipleship is to help someone who is struggling consider whether there could be a sinful root that is blossoming into sinful consequences. Repentance and ownership of the problem requires humility. Changing our patterns of thinking and behavior is hard work. However, the alternative path of taking medication to mask symptoms, allowing a label to define who we are, and forfeiting the potential for victory over a disorder is a heavy price for failing to consider a spiritual source for our behavior. To suggest that sin could be the root issue causing emotional or behavioral distress is considered by some to be harsh. However, when sin is the cause, this is actually good news. Sin can be confessed and conquered, a disorder cannot. In this life, we will never reach a point where we no longer struggle with sin. Each of us possess our own sin bend, or temptations in different areas. The Biblical way of dealing with our sin is to acknowledge it, confess it, and turn from it. To deny that sin is an issue that we all battle and to ignore that sin takes a toll on the stability of the individual is to miss the opportunity to see someone gain victory over destructive behavior. We can make choices that, when empowered by God, can actually cure the disorder. Colossians 3 and Ephesians 4 both encourage us that we have the ability to put off sinful behavior and put on godly conduct, which will impact our spiritual, emotional, and physical health. We have the ability to train our minds to "take every thought captive" (2 Corinthians 10:5). When we understand, when we confess and repent of sin, and trust Jesus and what he accomplished for us on the Cross, our identity is changed. God, the creator of the universe, no longer focuses on our sin - our failures, frailties, and futility. When God sees us, He sees our sin as forgiven. We are what the Bible calls "in Christ" - we are forgiven and unconditionally loved. This gives us a new identity - we are no longer enslaved by old labels or patterns of behavior. 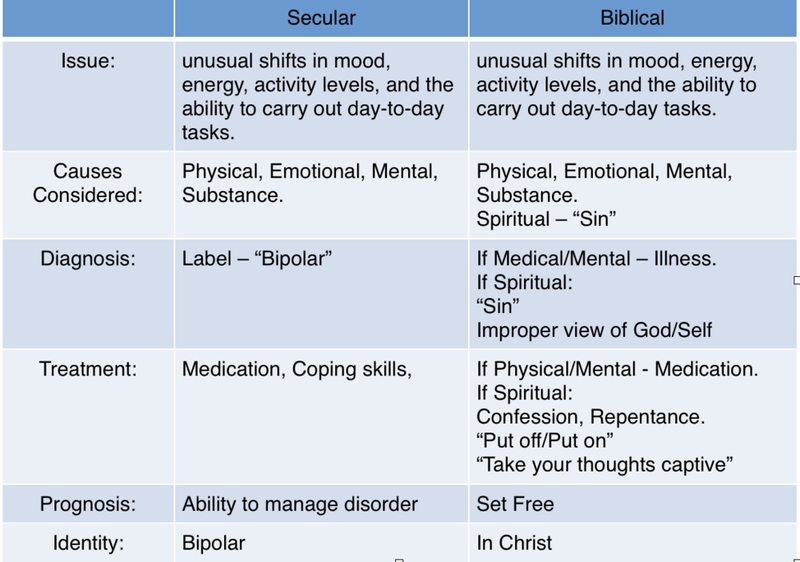 The following chart is a simple comparison of a secular approach to treating a disorder verses a Biblical approach. Both approaches observe the same behavior and consider physical and mental health concerns. The Biblical approach also considers that spiritual issues could factor into the disorder. If sin is the cause or a major factor in the disorder, the good news is that in dealing with the sin, a person can be hopeful that they will be set free from the disorder rather than spend the rest of their lives managing their condition. Here is why I love the Gospel. The cross of Jesus Christ not only saves me, it changes me. When I understand my sin is forgiven, my guilt is resolved. When I understand that God loves me and views me through what Jesus accomplished in my place, my shame is removed. I am "in Christ" - that is my identity. What Are We Looking For When We Look At Our Phones?